I have three wonderful kids and Christmas is an awesome time to be a dad. To witness their smiles and laughter on Christmas morning is a wonderful experience. So what do I want for my kids this Christmas? Not expensive presents, although we want to bless our kids with nice things. Not an abundance of gifts, with too many to choose from. Not the latest, coolest gadgets. I just want them to have enough. I want them to have enough, so that they don’t go looking for more. I want them to have enough, so that they don’t feel the need to compare their booty with that of their friends. I want them to have enough, and I want them to feel as though they are enough. I want them to feel loved for who they are, not for what they do. I want them to know that the reason for Christmas is that Jesus loves them just as they are and He has a unique plan for their lives. 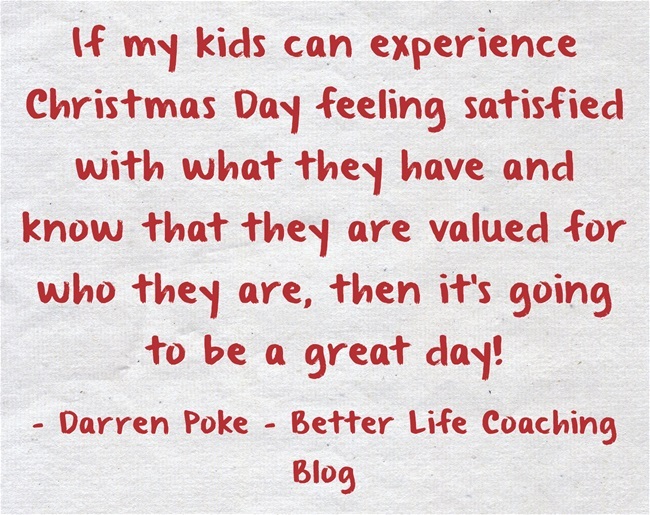 If my kids can experience Christmas Day feeling satisfied with what they have and know that they are valued for who they are, then it’s going to be a great day! This means that if I want my children to feel as though they have enough and believe that they are enough, then I need to role model this for them. What do you want for your kids this Christmas?